The Mines and Minerals (Development and Regulation) (MMDR) Act, 1957 was amended through the MMDR Amendment Ordinance, 2015, which was promulgated on the 12th January, 2015. The MMDR Amendment Bill, 2015 to replace the MMDR Amendment Ordinance, 2015 was passed by the Parliament and has come into force with effect from 12th January, 2015. The most important provision of the MMDR Amendment Act, 2015 is the grant of mineral concessions, for major minerals including iron ore, through auction by competitive bidding which is a transparent and non-discriminatory method and which will also obtain for the State Governments its fair share of value of the mineral resources. (v) Stricter penalty provisions to deter illegal mining. As per the MMDR Amendment Act, 2015 State Governments will conduct auction for grant of mineral concessions. The role of the Central Government is to prescribe the terms and conditions, and procedure, subject to which the auction shall be conducted, including the bidding parameters for the selection. Accordingly, the Ministry of Mines has framed the Minerals (Evidence of Mineral Contents) Rules, 2015, and the Mineral (Auction) Rules, 2015 and notified them in the Gazette of India thus paving the way for auction of mines in accordance with the MMDR Amendment Act, 2015. Ministry of Mines has also prepared the Model Tender Document including the Notice Inviting Tender, Summary of Mineral Block, and Mine Development and Production Agreement and provided to all the State Govts/UTs to help them in the auction process. This information was provided by The Minister of State for Mines and Steel Shri Vishnu Deo Sai in Reply to a question in Lok Sabha today. Mining leases are granted by the State Governments. Environmental Clearances are given by the Ministry of Environment, Forest and Climate Change or the State Environment Impact Assessment Authority. Therefore, the details of Public Sector Undertakings (PSUs) which have been closed/ are on the verge of closure due to want of environmental clearance in various states are not maintained centrally. However, no PSU of the Ministry of Mines has been closed/ is on verge of closure for want of environmental clearance. Ministry of Environment, Forest and Climate Change (MoEFCC) has notified the Environment Impact Assessment (EIA) Notification, 2006 under the Environment (Protection) Act, 1986 which deals with the process to grant Environmental Clearances. The projects of mining with mining lease area equal to or greater than 50 ha are handled at the level of MoEFCC for grant of EC. The projects with mining lease area less than 50 ha are handled by the respective State Environment Impact Assessment Authority. Time lines have been prescribed under the EIA Notification, 2006, according to which terms of Reference (TOR) shall be conveyed by the Expert Appraisal Committee (EAC) within thirty days of the receipt of Form-I to the Project Proponent. Thereafter, as per the TORs issued, the project proponents are required to comply with the conditions mentioned in the TORs which inter-alia include collection of base-line data, approved mine plan, conducting public consultations, and submission of final EIA/ Environment Management Plan (EMP) Reports to the Ministry of Environment and Forests along with all the relevant documents. On receipt of final EIA/EMP report after the public consultation, the project is appraised by the EAC in a transparent manner in a proceeding to which the Proponent is invited for furnishing necessary clarification in person or through an authorized representative. Thereafter, the EAC makes appropriate recommendations of the proposal and the Ministry takes the final decision with regard to Environmental Clearance as per the EIA Notification, 2006. This decision is conveyed to the Proponent within forty five days of the receipt of the recommendations of EAC. In other words, the decision is to be conveyed within one hundred five days from the receipt of the final EIA/EMP report/requisite documents from the Project Proponent. There is no restriction on private sector participation in the mining sector. As per section 5(1) of the Mines and Minerals (Development and Regulation) (MMDR) Act, 1957, mineral concessions are granted to either an Indian national or a company as defined in clause (20) of section 2 of the Companies Act, 2013. Mineral concessions are granted by State Governments. 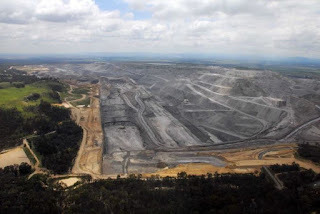 As mineral concessions are granted and executed by the State Governments, company-wise details of the mining leases granted to public and private sector companies are not maintained centrally. However, as per data available with Indian Bureau of Mines (a subordinate office of the Ministry of Mines) 11104 mining leases have been executed in 24 states as on 31.3.2013, out which, 483 are in favour of public sector and 10621 are in favour of private sector. State-wise breakup of the mining leases granted in favour of public sector and private sector is given in ANNEXURE - I.
Royalty is collected and appropriated by the State Governments. As such, details relating to royalty collection are not maintained centrally. As per section 23C of the MMDR Act, 1957, State Governments have been empowered to frame rules for regulating and controlling illegal mining. As such, regulation of mining for compliance of the lease deed conditions is in the purview of State Governments. Complaints received in the Ministry of Mines regarding irregularities/violations/illegal mining are, therefore, referred to the State Governments for appropriate action. However, based on the quarterly returns on illegal mining submitted by various State Governments to Indian Bureau of Mines (a subordinate office under the Ministry of Mines), state-wise details of instances of illegal mining reported in various parts of the country for last three years along with the details of action taken against the violators is given in ANNEXURE - II. Under ‘Grid Connected Rooftop and Small Solar Power Plants Programme’ of the Ministry 360 MWp projects have been sanctioned and 54 MWp aggregate capacity of projects have been installed. Under ‘Off-grid & Decentralized Solar Applications’ programme 108 MWp solar rooftop/ground mounted systems have been installed in the country for captive consumption. This was stated by Sh. Piyush Goyal, Minister of State (IC) for Power, Coal & New and Renewable Energy in a written reply to a question in the Rajya Sabha today. The Minister said that the systems are coming up with investment from rooftop owners and developers. Financing at low cost is important and one of the main factors for promotion. Ø Target set for installation of 40,000 MWp by year 2022. Ø Electricity Regulatory Commissions of 19 States/UTs have notified regulations for grid connectivity, net-metering/feed-in-tariff mechanism.